H.P. Lovecraft (1890-1937) has, in the over sixty years since his death, become both a legend and an enigma. He has come to be regarded as the leading American writer of horror fiction in this century and continues to be a major influence upon the field today; but his life, work, and thought remain poorly understood, and many myths about the man and his work persist. 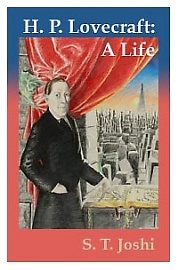 In this, the first full-scale biography in more than twenty years, S.T. Joshi—the leading authority on Lovecraft—has gone back to primary sources to set the record straight on the many-faceted “gentleman from Providence”: his early interests in science, mythology, and literature; his involvement in the “amateur journalism” movement; his towering presence in the pulp magazines of the 1920s and the fantasy fandom of the 1930s; and the posthumous rescue of his work by friends and devotees. Along the way, Joshi probes the literary, philosophical, cultural, and historical forces that shaped Lovecraft’s work and thought, provides capsule portraits of his close friends and colleagues, and studies the growth and development of all aspects of his creative work. Written from a sympathetic but critical perspective, Joshi’s biography dispels many of the myths about Lovecraft the man and win new converts to his distinctive literary work. H.P. Lovecraft: A Life. By S.T. Joshi. West Warwick, RI: Necronomicon Press; 2004; ISBN 0-940884-88-7 (trade paperback). This book may be purchased in trade paperback from Amazon.com or Barnes & Noble or directly from the publisher, Necronomicon Press.